Use the Device panel to view information about WebDAQ hardware, the capacity of internal and external storage, network settings, security access, and email settings. The Device Info tab displays by default when you open the Device panel. Each panel can be minimized by the user. The Device Info tab lists information about the WebDAQ device, system clock, firmware version and update utility, and calibration status, and provides two log files — the Info Log File lists notifications such as start and stop times, and the Error Log File lists error notifications. Name: The name assigned to the WebDAQ hardware. You can accept the default value or enter a new name. The name is saved in EEPROM, written to a hostname file at device boot up, and included in the data file header. When entering a new name, all alpha-numeric characters are valid. The name can't begin or end with a hyphen, nor include special characters. Model: The model name of the WebDAQ hardware. Serial Number: The serial number assigned to the WebDAQ hardware. Mac Address: The Mac address assigned to the WebDAQ hardware. This address is also on a label on the enclosure bottom. Restart: Sends a reboot command to restart the WebDAQ hardware. If an unexpected system error occurs during an acquisition, Safe Mode can be enabled using the "Restart in Safe Mode" checkbox in the confirmation dialog to prevent a schedule from starting automatically on power up. Shut Down: Sends a shutdown command to the WebDAQ hardware. This option is disabled when Power Button Action is set to Restart on the User Preferences window. (This is the appropriate setting when jumper W1 is removed.) Note that when jumper W1 is removed, the only way to shut down the WebDAQ is to unplug the power adapter. Refer to the Power-On Mode topic for more information about this mode. Timezone: Select a timezone from the drop-down list. 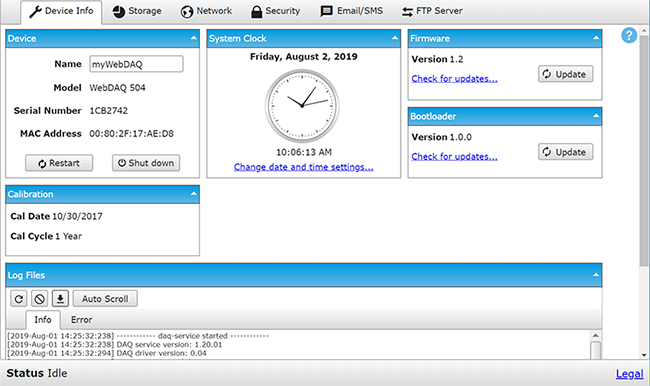 Synchronize with Internet Time Server: Tap on to synchronize the system clock with the National Institute of Standards and Technology (NIST) server. Tap off to manually set the date and time. This setting is on by default. Date: Enabled when Synchronize with Internet Time Server is off. Use the selector controls to select a date and time, or enter the time directly in the fields provided. Tap Apply to close the dialog box and save the settings. Firmware Information about device firmware. Version: The firmware version installed on the device. Check for Updates: Opens the Firmware Updates page at Firmware Updates. Update button: Searches the root folder of each storage location on the device for a firmware update file. When a file is detected, the update automatically installs and the device is restarted. To avoid confusion, we recommend that only one firmware file be present on each storage location at any time. Refer to the Firmware Update procedure for detailed information. Cal Date: The date when the WebDAQ hardware was last calibrated. Cal Cycle: The recommended calibration interval. The default is 1 year. Return the WebDAQ hardware to the factory for recalibration. Field calibration is not supported. Bootloader Information about the device bootloader. Version: The bootloader version installed on the device. Important! Updating the device bootloader is not typically required. Perform a bootloader update only if there are specific instructions on the Firmware Updates page to do so. Update button: Searches the root folder of each storage location on the device for a firmware update file. If an *.swu file with a bootloader version later than that installed on the device is detected, the bootloader automatically installs, and the device is restarted. Log Files Contains the Info and Error log files and a toolbar. The Info log file lists device startup initialization information, job and schedule activity, and alarm activities since system startup. The Error log file lists all errors that have occurred since system startup. Refresh: Refreshes the log file. do_not_disturbClear: Removes all notifications from the log file. file_downloadDownload: Downloads the info.log or error.log file to the local drive location determined by your browser download settings. Auto Scroll button: Scrolls to the end of the log file. The Storage panel lists the amount of used and available storage space on the device and external media, if present. Partitioned storage areas are indicated with "P#". An Eject button appears on the panel for external media. Use this button to unmount the media for removal. Note: if the external media is actively being used for data logging, this button will do nothing when clicked. Internal Storage Always shown. 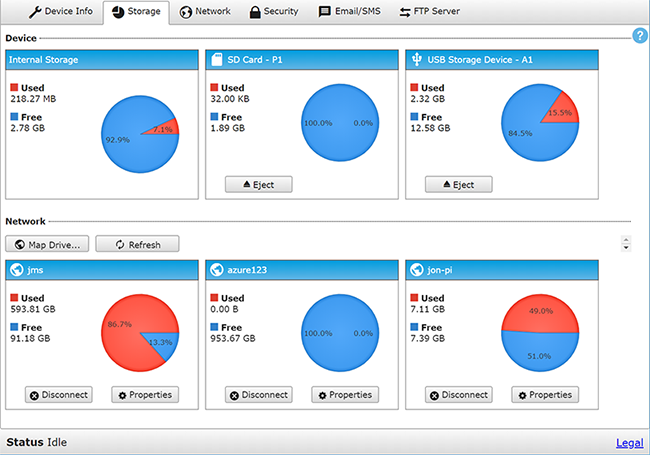 Shows used and free space on the integrated internal storage of the WebDAQ. SD Card Shows only if an SD Card is mounted on the WebDAQ. Shows used and free space on the external storage of media inserted in the SD slot of the WebDAQ. An Eject button is shown that can be used for safe removal of the media. USB Storage Device Shows only if a USB mass storage device is mounted on the WebDAQ. Shows used and free space on the external storage of media inserted in the USB connector of the WebDAQ. An Eject button is shown that can be used for safe removal of the media. The WebDAQ IP address type is set by default for DHCP/Link-Local. When connected to a network, the device first attempts to receive an IP address from a DHCP server. If this fails, the link-local address stored on the device is used (169.254.100.100). Network Settings Tap LAN to configure the settings for a wired network, or WiFi to configure wireless network settings. IP Address Type: Select DHCP/Link-Local (default) for automatic configuration, or Static to manually configure network settings. With the default setting, the device attempts to receive an IP address from a DHCP server when it is connected to a network. If this fails, the link-local address stored on the device is used (169.254.100.100). Default Subnet: The default subnet stored on the device. Default Gateway: The default gateway stored on the device. Primary DNS: The primary domain name system (DNS) server value assigned by the internet service provider (ISP); used to communicate with the device over the internet. Secondary DNS: The backup DNS value. Apply: Writes the network settings to the device; a restart is required. WiFi On/OFF button: enables/disables WiFi. When enabled, the WebDAQ scans for the available wireless networks that you can connect to. The network list updates every 10 seconds. Country listbox: Select the country where the wireless network is located. This value lets the WebDAQ know which regional WiFi settings to use. Choose a Network: Select a wireless network from this list and enter a password if prompted. To configure a wireless network not in the list, scroll to the bottom and choose Other to open the WiFi Network Other dialog box. Enter the SSID (network name), security type (NONE, WEP, or WPA/WPA2-PSK), and password used to access this network. Refer to your router documentation if required. Network Status Information about the LAN and WiFi networks, such as the current IP address. The Security tab allows the user to sets the user access level and administrator password. There is only one user defined. The user name is "admin". By default, the password is also set to "admin" and the security level is set to "Off". To limit access to the web page, change the password and then set the desired security level. Security Level Sets user permissions with a slider control. High: Access to the web page requires a password. Medium: Access to the web page is permitted for any user and data can be read, but any changes to the WebDAQ configuration or files require a password. Off: Full access is permitted for all users without having to enter a password (default). Tap Apply to save the access level. Change Password Allows a user to change the password for the "admin" user. The default password is "admin". Enter Password: Sets the new password for the "admin" user. Confirm Password: Enter the password again to confirm the password change. Tap Submit to save the modified password. Depending on the current security setting, if you have changed your password from the default, you may be prompted to enter your old password before the new one is applied. The Email/SMS tab allows you to specify the SMTP servers that will be used to send email and text notifications. Use the Toolbar utilities to define an email server, modify the settings of an existing server, and to select the default server for sending email notifications and SMS messaging. Enable the checkbox of the server you want to set as the default. Create Opens the SMTP server dialog to add an SMTP server to the server list. The pre-defined servers are GMAIL, LIVE, and YAHOO. Choose Other if the server you want to define is not one of the pre-defined options. Name: The pre-configured server name or a name you create for a server you define. Server: An email server where you have an account. There are lists of common email servers on the internet. This usually takes the form “smtp.server.com”, but it varies. Port: Usually 587. Check the value for the server you are using. Email: Your email account on the selected server. Delete Deletes the selected server definition. Edit Opens the SMTP Server Settings dialog box (see above) for you to modify the selected server definition. The password field is left empty for security reasons. Test Sends an email to your email account on the selected server to test the server settings. A message displays and an email is sent to indicate that the WebDAQ device SMTP server verification was successful. Your SMTP server may block notifications from the WebDAQ app. To allow notifications, configure your SMTP server to allow access from less secure apps. We recommend that you create a dedicated email account for WebDAQ notifications, separate from your personal email account.